The FORCE™ portable mining weighbridge scale was specifically designed to endure the world’s most challenging of environments whilst specifically addressing the need for high accuracy weighing within the mining industry and are without doubt the Worlds Toughest Mining Scales. Each system is designed to optimise accuracy and efficiency of use, and as our customers have experienced – built tough to last harsh working mine environments. The FORCE™ portable weighing system can be used either statically or in motion and offer an unbeatable and proven weighing speed of up to 12kph (7.5mph). 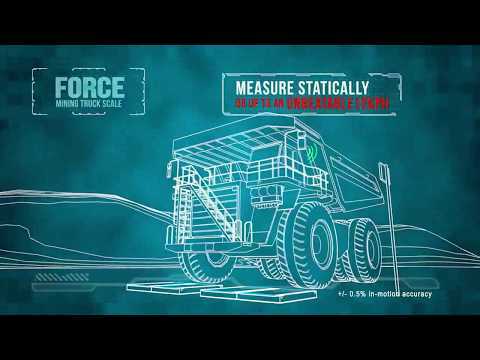 Unlike standard mining truck weighbridges, the FORCE™ mining truck scale is made up of a combination of individual weigh pads which measure the load on each wheel and axle combination of the dump truck/haul truck. Its modular design enables it to be configured to weigh any make and model of mining truck.